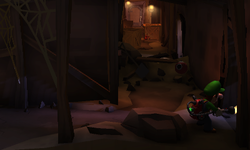 The Canyon Hall (Ravine Passage in the PAL version) is a room inside the Old Clockworks in Luigi's Mansion: Dark Moon. The Canyon Hall is accessed by taking the north door inside the Storm Cellar. This is a long, L-shaped room that is partly blocked by debris. On the far left side, there is a hand-operated drill that gives five coins if it is vacuumed. The main part of the hall has some crates and mirrors. The Canyon Narrows is accessed by removing the wallpaper near the south of the hall. The door to the north leads to the Roundhouse Pit and the door to the right of this leads to the Canyon Stairs. During C-2: Underground Expedition, Luigi needs to travel through the Canyon Stairs to reach the Roundhouse Pit where he can go to the second floor of the basement. Luigi needs to use the Canyon Narrows to reach the other side of the Canyon Hall because of the debris. Before Luigi can go to the Roundhouse Pit, he has to fight a Sneaker. This page was last edited on November 10, 2017, at 21:07.